Provide comfort for the family of Dorothy Jean Edwards with a meaningful gesture of sympathy. 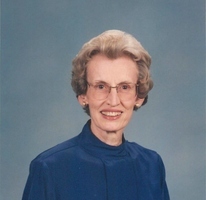 Dorothy Jean Edwards, 87, passed away peacefully at her home in Dallas, TX on Tuesday, March 19, 2019. Born May 27, 1931 in Slate Springs, she was the daughter of the late Oris L. Edwards and the late Elthia Davis Edwards. Dorothy was a graduate of Slate Springs High School, and was of Baptist faith. She went on to receive her Bachelor’s Degree in Education from Mississippi College in Jackson. From there she attended the Baptist Seminary in New Orleans. She served the First Baptist Church of Baton Rouge for several years as secretary. She left there and worked at LSU as Administrative Secretary for the BSU Director. While there, she would often have Bible study in her home for the BSU students. She was very involved with her students at LSU, and remained in contact with many of them until recently. After moving to Dallas, TX, she served as secretary for the University of Texas under the Professor of the Ophthalmologist Department. Throughout her life she was an avid reader. She also enjoyed cooking for just about anybody, and she also spent a great deal of time outdoors because she absolutely loved taking long walks. Dorothy touched the lives of many as she was a caring, giving, and wonderful lady. She will be missed dearly by her family and friends, but her memory will live on in their hearts. Pryor Funeral Home is honored to be serving the Edwards family. A funeral service celebrating her life will be held Sunday, March 24, 2019 at 2:00pm at Pryor Funeral Home. There will also be a visitation on Sunday from 1:00pm until service time at the funeral home. Bro. Jimmy Vance will be officiating. Interment will follow at Bethany Cemetery in Slate Springs. Serving as pallbearers will be Mike Edwards, Mark Edwards, Mitchell Edwards, Hunter Harris, Randy Dye, and Matt Munsen. She leaves behind her sister, Maggie Jo (Kenneth) Magness of Batesville, MS; her brothers, Davis (Betty) Edwards of Calhoun City, and Melvin (Brenda) Edwards of Pollack, LA; and a host of nieces and nephews. She was preceded in death by her parents, brother Robert, and a nephew, Phillip Magness. To send flowers in memory of Dorothy Jean Edwards, please visit our Heartfelt Sympathies Store. We encourage you to share your most beloved memories of Dorothy Jean here, so that the family and other loved ones can always see it. You can upload cherished photographs, or share your favorite stories, and can even comment on those shared by others. Provide comfort for the family of Dorothy Jean Edwards by sending flowers.